Man arrested after newly released video shows him shooting at black protester in Charlottesville. Police stood by and did nothing. 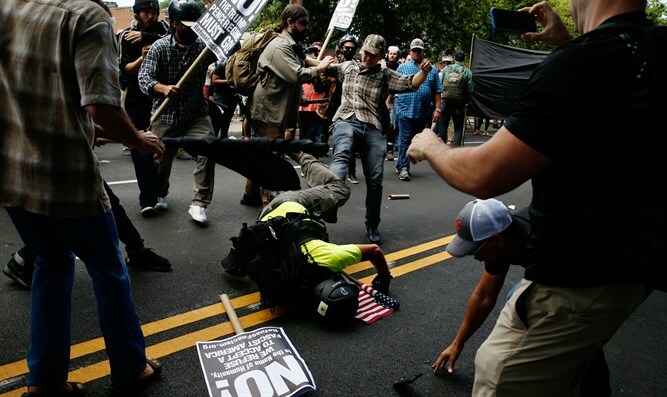 A newly released video shows a white nationalist firing a gun at a black protester in Charlottesville, Virginia, during the violent clashes two weeks ago, as police nearby refuse to intervene. The white nationalist can be seen cursing and hurling racial epithets before taking out a gun and shooting at the protester, and then calmly strolling away. The man has since been arrested, but the incident raises the question of why a half dozen Virginia State Troopers at the scene refused to intervene. "We all heard it and ran - I know damn well they heard it," Rosia Parker, a community activist in Charlottesville, told The New York Times. "They never moved." Virginian police have come under heavy criticism for their slow response to the unfolding violence, especially after 20-year-old James Fields, of Ohio barreled his silver Dodge Charger into a group protesting the rally and killed 32 year old Heather Heyer. Virginia Governor Terry McAuliffe initially defended the police, telling reporters that they were ordered to stand down due to the sheer amount of firepower the white nationalists had. "They had better equipment than the police did," he said. "You saw the 'militia' walking down the street, you would have thought they were an army."